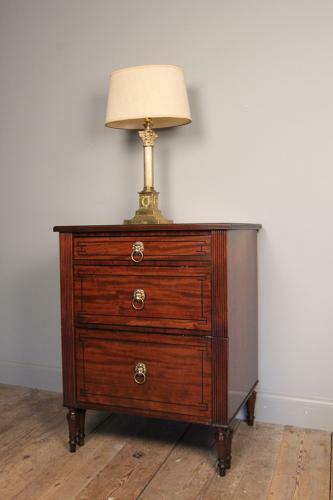 A stunning Regency night cupboard or bedside cabinet made in highly figured Mahogany with the original lion head brass handles. Having 2 Mahogany lined drawers and a centre cupboard, all flanked by reeded uprights and raised on tapering ring turned legs. Wonderful rich colour and lustre throughout this beautifully presented Chest. English, Circa 1820.